Racheal Malatji lives in a one-roomed mud hut with her five children and five grandchildren in the Bolobedu village, near Tzaneen. The EFF leader pointed out Racheal Malatji’s living conditions, who lives in a one-roomed mud hut with her five children and five grandchildren in the Bolobedu village. EFF leader Julius Malema has used the living conditions of an impoverished Limpopo family of 11 to demonstrate what he claims is government’s inability to deliver on its pre-election promises. The unit, comprising family matriarch Racheal Malatji, her five children and five grandchildren, have lived in a one-roomed mud hut in Block 12 of the Bolobedu village, near Tzaneen since 1994. “We applied for an RDP house in 2005. But since then, the authorities always send us from pillar to post,” Malatji told The Citizen. “Sometimes, they would tell us to be patient, while some days they would say our house was given to another resident. We are tired of the long wait and we are appealing to the housing department to come to our rescue,” said Malatji. Malema said there had been no improvements to the living conditions of residents. 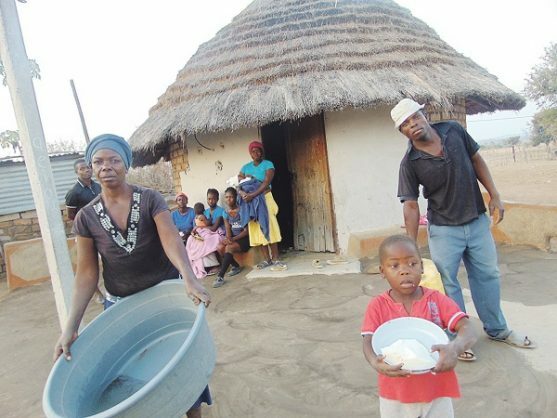 But ward councillor Emily Ramolefo said the Malatjis were on the waiting list for indigent families earmarked to receive RDP houses from government. She said the ward, which consists of six villages, had about 700 households waiting for houses.